The Governor of Ebonyi State, David Umahi, has disclosed how he rented 2,000 persons to beef up the crowd that came to cheer President Muhammadu Buhari at the Abakiliki Township Stadium. He said he did that to save the president from seeing empty seats because his party, the All Progressives Congress (APC) was not on ground in the state. He has also debunked allegations that he is paying any amount he likes to workers in the state saying that if he is doing that, he would have long been exposed in the media. Umahi was reacting to APC gubernatorial candidate, Sonni Ogbuoji’s allegation at the presidential campaign rally at the Abakaliki Township Stadium, that Ebonyi workers have had to endure poor pay, no gratuity for retired workers and even some of them have been reduced to mere slaves that do not deserve any form of promotion. 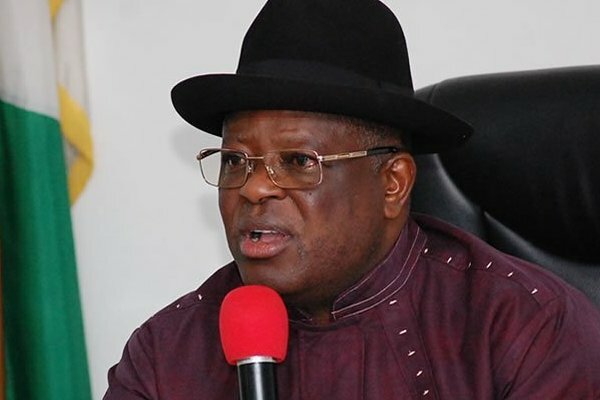 Speaking to journalists shortly after seeing off President Muhammadu Buhari to his helicopter on his way to Calabar, Umahi denied that the 5,200 workers he inherited had been reduced to 3,200. He said rather than do that, he released the sum of N4 billion to the workers to access soft loans to help them to do any form of agricultural business of their choice. He added that he even had to allow them to use Fridays to engage in any business they prefer that would help them generate additional income. The governor said: “You see, when they have nothing to accuse you of, they come up with something. In the first place, the staff I met, I have never retired anyone of them and I don’t think two percent of the workforce has been retired. But I have said that there is no need to employ more people because the condition of those in service – not only in Ebonyi State but also, nationwide – is not palatable. So you have to take care of those you have employed before you think of employing more people. “That is why I made available N4 billion to the civil servants to take loans within a range they can pay back ; even if any of them has up to 25 years to stay in service, the loan will last for 25 years. “I gave them Fridays free to go and do any agric business of their choice.. Because, I know there is no amount of money you will pay civil servants that will be enough for them; there is always nothing left after paying salaries for you as a governor to work with. Because, the essence of one being in government is to do something for the people; but when you use 100 percent of your earnings to pay salaries, then what are they working for? So, I devised a means whereby everyone should be doing something more useful and that is why we made available soft loan to them. He described Ogbuoji as spent force who has nothing to campaign with. The governor said as the Chairman of South East Governors Forum, he decided to organise 2,000 people to fill the stadium to welcome President Buhari because he didn’t want him to feel he was not liked by the people of the state or the region, that has benefited from his administration’s projects. Umahi said: “They have nothing to talk about but complaints. The last time Mr. President was here, they wrote a 15-page petition against me and Mr President said to me, don’t allow your frustration to overwhelm you. We have performed beyond human expectations and that is their problem; they have nothing to campaign with. On the allegation that he bamboozled the president, pretending to be his supporter while he was doing everything underneath to frustration his re-election bid, the governor said: “I don’t understand what they mean by support. We belong to two different political parties and so the support for Mr. President as a governor, is what we are doing. We are not castigating Mr. President; rather, we are supporting him; that is our support for him. We acknowledged publicly what he, Mr. President ,is doing for Ebonyi State, that is the support we are giving to him. On the allegations that he initially denied the APC use of the Abakiliki Stadium, Umahi said: “The first time they wanted to use the stadium, But ;they had two factions of the party, and they were likely going to fight and destroy our property. So, I said no; they should clear with the Commissioner of Police and come up with one set of leadership so that they can use the stadium and I was going to give it to them free of charge. “Today, not only did we give them the stadium which of course is important of me it to give them when Mr. President is coming;, we renovated the stadium and painted the seats. We called them for a security council meeting; some of them came and we asked them what they want. spectators ,who appeared during President Buhari’s Electioneering Campaigns in the South East. But the fact of the matter here is that President Buhari and members his Axis of Evil Party,so called APC , haven’t got an iota of chance as far as our South East is concerned, vi- a- vis, in this Presidential Election of 2019. During 2015 Presidential Election,Candidate Buhari did manage to garner only 5% of the votes in our entire South East.But this time round,it’s gonna be 0% for Buhari and his Party. However,he did manage to win the Presidential Election of 2015 because his Fulani kinsman and the then Chairman of INEC,Prof. Attiharu Jegga helped rig the Election for him. That bloody Igbophobe, Mallam Muhammadu Buhari, has never for once hidden his utter disdain for us Ndigbo. Oh yes! The bloody illiterate son of an undocumented Fulani cattle driver alien from Niger Republic, loves to hate us Ndigbo with passions. President Buhari and his men must be exceptionally very daft,unintelligent and also delusional to believe that any normal Igbo man or woman will ever cast his or her vote for Buhari and his Axis of Evil Party,the APC. No never! Not after those Python Dances coupled with the cold blooded murders and slaughters of our Igbo Youths by Buhari’s Nigerian Janjaweed Army of Vandals and Morons,ordered by Buhari himself. Down with Buhari’s Hausa/Fulani Islamic Hegemmony!! All Hail Biafra,our God’s own Land of the Rising Sun!! !